The trail leads them to a laager of Norbard houseboats locked in the ice, and only the heroes are able to delay a brutal assault by Timpski's band. The fragile situation is soon complicated by a blossoming romance between Jaani and Bruutsch, two literature-loving goblins from Festum, and disaster strikes. This first adventure in the Theater Knights Campaign introduces important characters, races, and power blocks, and sets the stage for new developments in the history of Bornland and the legendary Order of the Theater Knights. This book includes all necessary supporting information, such as stats, maps, and floor plans. To play, you need The Dark Eye Core Rules as well as the Aventuria Almanac, which provides a deeper understanding of the setting. 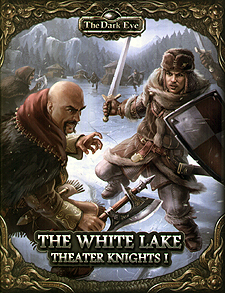 The White Lake may also be played as a stand-alone adventure.